Indisputable fact number one: Wolf stands for Wolfgang and Tony stands for Antonio. Indisputable fact number two: Wolfgang is what Mozart was called; Antonio belongs to Salieri. Three: They were contemporaries. Four: They lived in Vienna at the same time. Five: They both composed music. After that things get murky. There are literally millions of people like me in that they have seen both the play and the film. I find both so fascinating that I have seen four different professional productions of the play and have watched the Amadeus DVD more times than I can remember. But Buffalo has an opportunity to get to know it in a new format. 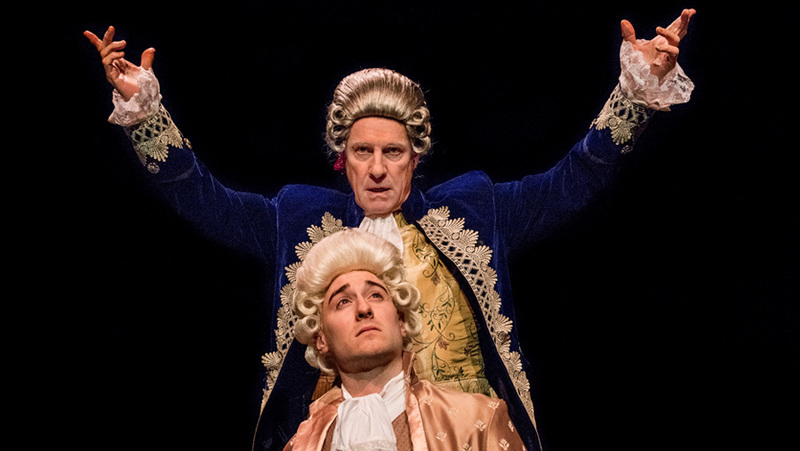 On the January 20, 21, and 22 in Kleinhans Music Hall, the Buffalo Philharmonic will join forces with actors from the Irish Classical Theatre Company to stage a production of Shaffer’s Amadeus. I intend to be there to take it all in. The play is made around two major roles: Wolfie and Tony. But Salieri is the big potato here, even though Mozart’s given name forms the title. (As well as Wolfgang, the little lad was burdened with John, Chrysostom, and Amadeus. Chrysostom comes from the Greek for “golden-voiced” and Wolfgang means means “loved by God”). The music resembles a mouse-and-elephant pie—just two ingredients, one of each species. Common sense tells us that any two composers living in the same place at the same time would have interacted, at least a little bit. Salieri, in fact, interacted with just about everyone composing music in Vienna in the 1780s-1790s—Schubert and Beethoven were among his students. A teacher can’t do much better that. And thousands of documents of a variety of different kinds give us—and gave Peter Shaffer—a million indisputable facts.. The one diamond to be found among a million pieces of coal was something someone wrote in one of Beethoven’s conversation books: “Salieri is very sick again. He is completely deranged. He keeps fantasizing that he is to blame for Mozart’s death…” That is, however, a diamond mainly in its being so precise. When those words were written, to let Beethoven know what the gossip of the day was, “everyone” knew about that murderer rumor. But the genius of Shaffer did two things with the jewel. First Shaffer wove a basic narrative from it, covering roughly half of Mozart’s lifespan—two composers, same place, same time, one more successful than the other, one dies young, the other one goes insane, etc. That alone would make for a fairly good play. But there is a touch of the poet in Shaffer and it put into his head something truly original: Salieri’s motivation. An original idea, but also horrendously misleading. And to “horrendously misleading” two other charges could reasonably be added: “scandalously misleading” and “criminally misleading.” Because here is another indisputable fact: Shaffer’s words have almost set in stone a gigantic piece of fake news. From now on and for all time, Antonio Salieri will be as reviled as Judas Iscariot has been for 2,000 years. Not just as a killer, but an ungrateful misanthrope. Let’s take a relevant detour for a minute. In 1927, the sons of William Gladstone, the greatest Liberal prime minister Britain has ever known, were in court to defend the honor of their old man, who had been dead for nearly 30 years. Someone had written a biography, the sons had called the writer a liar, and so he sued them. Very much like the outcome when Oscar Wilde sued the Marquess of Queensbury, it was the biter who got bitten. But at least Gladstone’s honor had been affirmed and upheld. The sad thing is that Salieri’s sons—if he ever had any—are denied satisfaction by a divine statute of limitations I’ve just invented. But if I went to court on their behalf in 2017, I would a) ask that damages be awarded to the tune of 10 percent of the vast fortune Shaffer and his heirs have made from the most brilliant brainwave he ever encountered; and b) I would offer as Exhibit A for the prosecution what is found when you do a Google search for images of Salieri. The results of the Google search, as usual, vary from request to request, but it is certain that the presiding judge will find that at least a third of the images are not of Salieri at all but of F. Murray Abraham, the actor who won an Academy Award for portraying the composer in the film, for which Milos Forman won a Best Director Oscar to go with the one he won for One Flew Over the Cuckoo’s Nest. You are also likely to find at least one portrait of Mozart, and one of the emperor who told Mozart (in life and in both the play and the film) that he’s using “too many notes”—and conceivably one of Pushkin, who wrote a poem about the two composers, and Rimsky-Korsakov, who wrote a short opera based on the poem. But what about this production that’s coming to Kleinhans this weekend? Good question. It is impossible for any staging of the play to be as effective as the film in one crucially important respect: In a film the actual sounds of the music can be used effortlessly and all the time (perhaps even subliminally) to accompany the story. That is what one might reasonably call “a special effect.” In an in-a-theater production of the play, the music is piped in through the sound system. In the film it is in the soundtrack from the first frame to the last. But how, precisely, will music and words be combined in this weekend’s performances with the Buffalo Philharmonic Orchestra, in a full concert hall? Getting the answer to that question is the thing I am personally most looking forward to. Being greedy, I plan to attend all three performances! Starring Vincent O’Neill as Salieri and P. J. Tighe as Mozart. With Kathleen Macari as Constanze Weber, wife of Mozart; David Lundy as Joseph II, Emperor of Austria; Elliot Fox as Count Franz Orsini-Rosenberg, Director of the Imperial Opera; Doug Weyand as Baron Gottfried Van Swieten, Prefect of the Imperial Library; and Anthony Alcocer and Ray Boucher as Venticelli I and II. All under the direction of Fortunato Pezzimenti. The BPO will be led by conductor Adam Luebke.